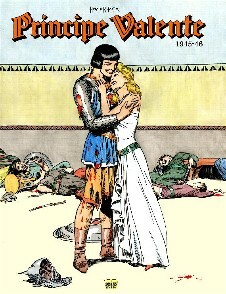 Manual Caldas did wrote a book about Prince Valiant once; Foster e Val (see resource chapter for the latest prints). But that was long ago. Now he is intending to re-print the first Hal Foster material in a large, high quality and black and white format. There will be 1000 books printed of each issue. The books are published in Portugal (serie 1), in Spain (serie 2) and in English language (serie 3). In each country a different publishers name is choosen. The Portuguese edition is a combination of Livros de Papel and "Vilela". The last book in Portugal is printed by Vilela alone under the name of "Bonecos Rebeldes". You can buy these softcover books with Manuel. The second book also includes "Castelo Medieval". This is one of the best prints ever made!! Price is 25 Euro per book in Portugal.